The GR Supra Racing Concept (back) and the development model of the 2019 Toyota Supra. In the least shocking news ever, the new Toyota Supra will keep with Supra tradition with a front-mounted inline-six engine and a rear-wheel-drive layout. You know what else isn’t shocking, at all? The fact that the road-going Supra is going to “debut” later this week in a camouflage wrap. 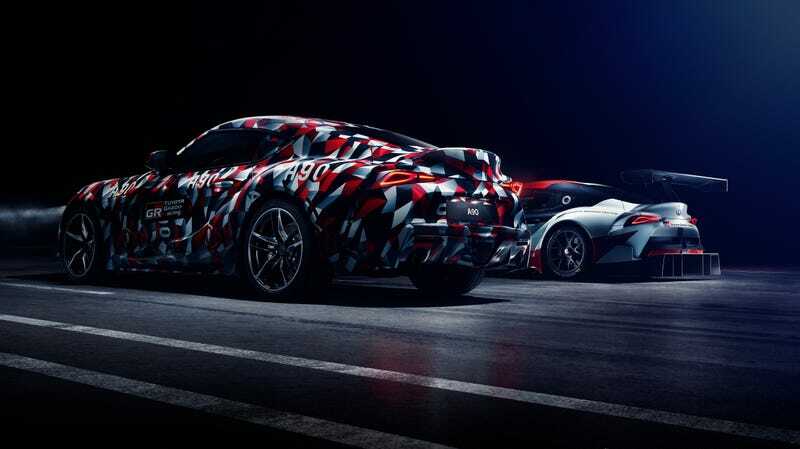 Both of those tidbits came in a Toyota press release on Monday, in which Toyota announced those two details about the Supra—nothing official on power, or transmission, or anything—and said it would be at the Goodwood Festival of Speed in the UK this week in prototype form. The car will make daily hillclimb runs Thursday through Sunday, Toyota said, and the GR Supra Racing Concept that we also know barely anything about will be on display during that. Toyota said the development road car will be “in action” at Goodwood and that people there will be able to take a “close-up look” at the racing concept, which seems to mean the road Supra will only be popping out of hiding to make runs during the week while the racing version is on display. The thousands of motoring fans attending the festival will also have the chance to take a close-up look at the Toyota GR Supra Racing Concept. Alright. Enough. What is going on here, Toyota? This months-long, frustrating car reveal is the opposite of exciting. Even then, that was just a race car that Toyota used to confirm it was building the Supra instead of, you know, saying, “We’re building the Supra.” That was four months ago, and we’ve all been sitting around since waiting to hear more about the production car. A glimmer of hope came last week, when the Toyota Europe Twitter account posted that the Supra would be at Goodwood this week. That’s all it said, along with a picture of a camouflaged Supra. This is not cool. This is more prolonged and frustrating than waiting for those last 25 wedding guests to RSVP already, while also wondering why you invited their rude selves in the first place. Toyota had it all with the Supra nameplate when it announced the car would come back for a fifth generation after two decades of absence. Whether a person is a car loyalist or just someone who’s seen Fast & Furious in passing, the Supra is the Supra. Yet, somehow, the approach to this revival has been exhausting rather than exciting, and Toyota’s chipping away at the shrinking mound of anticipation by teasing the car with no real information to hang onto. The Supra is supposed to come onto the market during the first half of 2019, and it honestly feels like it’ll be then before we know anything about it. Or maybe Toyota will just sell the thing in full camo, at this point.